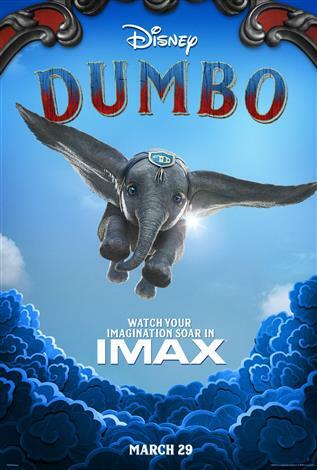 The IMAX release of Dumbo will be digitally re-mastered into the image and sound quality of The IMAX Experience® with proprietary IMAX DMR® (Digital Re-mastering) technology. The crystal-clear images coupled with IMAX's customized theatre geometry and powerful digital audio create a unique environment that will make audiences feel as if they are in the movie. Circus owner Max Medici (Danny DeVito) enlists former star Holt Farrier (Colin Farrell) and his children Milly (Nico Parker) and Joe (Finley Hobbins) to care for a newborn elephant whose oversized ears make him a laughingstock in an already struggling circus. But when they discover that Dumbo can fly, the circus makes an incredible comeback, attracting persuasive entrepreneur V.A. Vandevere (Michael Keaton), who recruits the peculiar pachyderm for his newest, larger-than-life entertainment venture, Dreamland. Dumbo soars to new heights alongside a charming and spectacular aerial artist, Colette Marchant (Eva Green), until Holt learns that beneath its shiny veneer, Dreamland is full of dark secrets. Directed by Tim Burton (“Alice in Wonderland,” “Charlie and the Chocolate Factory”) from a screenplay by Ehren Kruger (“Ophelia,” “Dream House”), and produced by Justin Springer (“TRON: Legacy”), Kruger, Katterli Frauenfelder (“Miss Peregrine’s Home for Peculiar Children,” “Big Eyes”) and Derek Frey (“Miss Peregrine’s Home for Peculiar Children,” “Frankenweenie”), “Dumbo” flies into theatres on March 29, 2019.